Security professionals today are facing an enormous range of tasks that require trustworthiness, conscientiousness and dependability. From the threats of the Information Age and the cloud to physical safety and security, it is your job to protect data, property, and people against risk and loss. Your role is important and means being held to high standards of right and wrong. Security professionals are expected not only to make ethical decisions but to also follow a code of ethics. Ethics are based on a collection of values, morals, and good judgment. 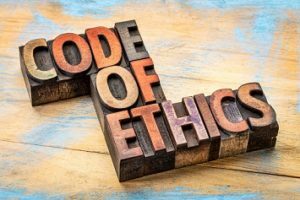 An effective code serves to reinforce ethical values so they are used as an automatic response. The very word “security” stands for safety, protection, comfort, and confidence. Individuals in the security profession need to live up to those words. Respond immediately to an employer’s or client’s professional needs, and treat him or her with the utmost respect. Be honest in all your dealings with employers, prospects, or clients. Exhibit exemplary conduct on and off the job. Always arrive on time, prepared for work. Maintain a safe and secure workplace or environment. Do not make promises or representations that cannot be supported by the solutions you propose. Enforce all lawful rules and regulations, and do not engage in deceptive, misleading, or unlawful activities. Encourage liaison with public and life safety officers. Comply with all applicable local, state, and national codes and regulations. Comply with all state certifications requirements applying to your work. Develop good rapport with others in your profession, and strive to attain professional competence. Encourage high standards of everyone in your department or team and company. Delivering services critical to the safety and security of the public, you must be every bit as accountable to the individuals you serve. Both public and private sectors increasingly demand high quality in their security technology. Equally, the security industry itself requires increasingly higher levels of professionalism and sophistication every day. Protection of property and persons must be combined with strict respect for laws, regulations, and a code of ethics.